Sneak Peak at my 6-week program. Are YOU ready to join? My passion is helping others with their fitness journeys. Rome wasn’t built overnight. It’s the small goals that lead up to the bigger goals. It’s about not giving up too soon, when things seem so far away. Getting motivated, inspiring ladies together to achieve the unthinkable is my mission in life. I love the fact that other woman can help lift each other up, whether it be in life or in fitness. I am one of those women who will help push you beyond what you think is possible and inspire you to become your personal best! I will make sure you get the most out of this program, so you can be the best version of yourself. Together, we will find a communication method that works best for you. We will do weekly calls to talk about goals and struggles. We will stay in contact to make sure you are following the plan that we set together. For my busy girls, you can email me any questions or struggles you are having. Together we can push past anything and achieve so much! My name is Samantha. I was born and raised in the beautiful city of Winona, MN. I currently live in Orlando, Florida. My childhood was full of many activities with my 4 sisters and amazing parents. But as a young girl, my favorite activity was gymnastics. My parents were consistently pushing me to become the best gymnast I could. I remember spending hours at the gym each week becoming stronger and better. I committed myself to that sport and it showed. Before I knew it I made it to the top team. Competing was my life, in fact it was more than 10 years of my life, and I can’t thank my parents enough for never giving up on me. Without their support and time I wouldn’t be where I am today. I now am a certified personal trainer through American Council on Exercise. I have been training since 2014 and it has become my biggest passion in life. Self-discipline & goal setting have become most important to me. You have to set the mind right if you want to succeed with your goals. 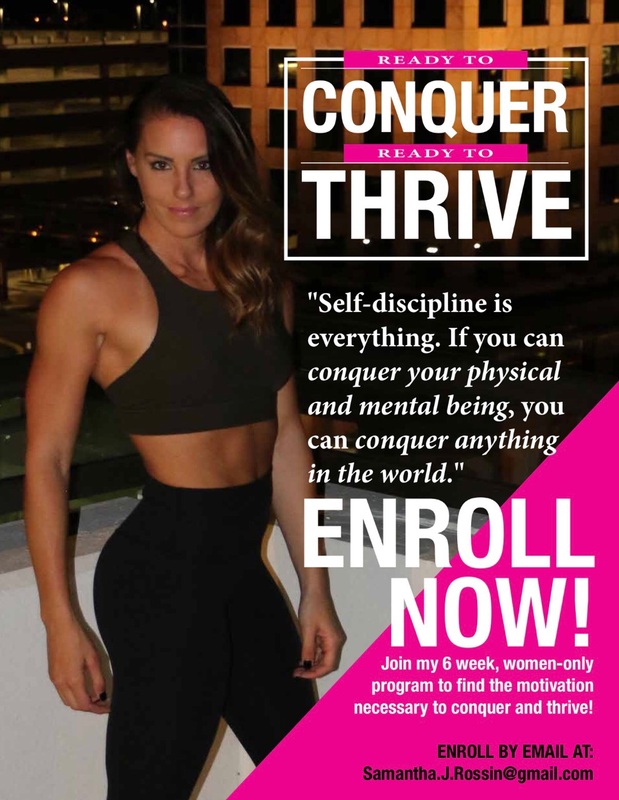 I recently launched my 6 week fitness program where my mission is to help these ladies reach their goals with the right mind set and self-discipline. When women come together to lift each other up ANYTHING is possible. We will have a weekly call to go over what your goals are and what you have achieved each week. I will be messaging you to make sure you stay on track every day. You will receive 5 workouts a week that will be performed at the gym. I will be here for accountability, questions, anything you need. I will help you find a routine that works best for your specific needs. I will e-mail you a 6 week calendar of what is expected of you during this program! Nutrition: I cannot provide you with a specific nutrition plan but I will be sharing with you what has worked for me! Let’s work together so you can get in the physical and mental shape that allows you to be who you want to be. Signup now and receive updates and deals!